Naumburg, a fortified town of Prussia, in the province of Saxony, on the Saale, near the junction of the Unstrut, 23 m. S. S. W. of Halle; pop. in 1871, 15,120. It is an active manufacturing and commercial town, but the once famous fair of Naumburg has lost its importance. Among the principal buildings are the cathedral, one of the finest specimens of German mediaeval architecture, remarkable for its lofty towers and double choir, completed in 1349, and the restoration of which was begun in 1874, and the church of St. Wenceslas, with a famous picture of "Christ blessing Little Children," by Cranach. It is the seat of the Protestant cathedral chapter of Naumburg-Zeitz, and has one Roman Catholic and four Protestant churches, a gymnasium, and several other schools of a high grade. An annual children's festival is celebrated here, in commemoration of the raising of the siege by the Hussites under Procopius, which according to tradition took place July 28, 1432, in consequence of the entreaties of the children of Naumburg. This event has been dramatized in Kotzebue's Die Hussiten tor Naumburg, but its authenticity has been called in question by recent historians. 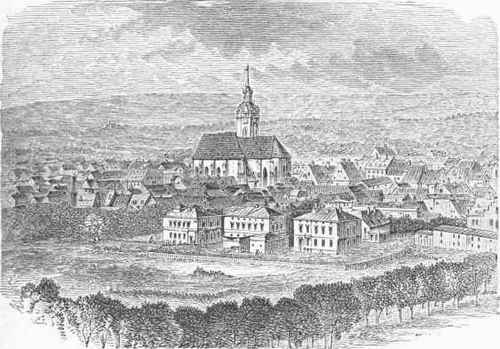 Several treaties were concluded at Naumburg in the 15th and 16th centuries, and the town was of strategical importance during the thirty years' war and the wars of 1806 and 1813.